Mining Publications International was established in 1997 to provide advertising services to a leading mining organization, The Canadian Institute of Mining. MPI between 1997 and 2009 expanded to enhance our own promotional services. We have included our proprietary eMining Blast services, on-site Targeted Classifieds & press releases, trade show & conference promotions called Hit Lists. We have also added other leading international mining publications to help our clients with their expansion plans. For the past eight years to 2011, we have been the exclusive Canadian representative of The Society for Mining, Metallurgy & Exploration (SME-USA), the world's largest professional mining organization. We are proud contributing corporate members of the Canadian Institute of Mining (CIM). Having worked for CIM in the past selling trade show booths and advertising in their illuminating publications, we now help to promote the annual CIM show held in locations across Canada. We received an endorsement on LinkedIn from a mining engineering student we are proudly helping in his studies. We personally & proudly introduce our students to mining companies at the many international shows we attend. We are active in both the national and international marketplace with a 22 year history rich in marketing experiences. We definitely look forward to the new challenges in our industry, anticipating growth and prosperity as we enter the 21st century. Mining Publications International will proactively embrace the challenge of change to achieve our financial goals and contribute to the well being of our customers. We will continue to adopt new technologies that will bring value to all. Through customer interaction, MPI will continue to introduce new marketing concepts & ideas, plus only exceptional digital & print publications into our global market place. Our strong client focus results in a flexible business model to meet the needs of different mining clients. We build respect & credibility with our clients by adding value. We will leverage our international presence to capture unique marketing opportunities for our clients. Since our inception in 1997, the founding values of honesty, integrity and customer commitment have never been compromised. They never will. Now in its 82nd year, the Prospectors & Developers Association of Canada (PDAC) hosted its annual convention and surpassed 25,000 delegates. Now in its 82nd year, the Prospectors & Developers Association of Canada (PDAC) hosted its annual convention and surpassed 25,000 delegates for the fourth consecutive year. It is the mineral industry's largest annual event which took place March 2 - 5, 2014, at the Metro Toronto Convention Centre. Canadian Prime Minister, The Right Honourable Stephen Harper and 49 federal parliamentarians attended to lend their support for the mineral industry. See photos in the right-hand column of home page. 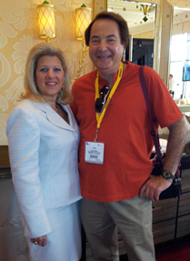 Lewis Bonder with Greater Grand Sudbury's Mayor, Marianne Matichuk at the Wynn Hotel in Las Vegas. 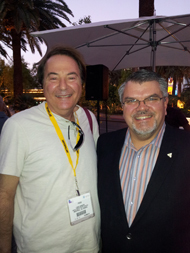 An incredible soirée during the 2012 MinExpo show, put on by the Government of Ontario. Seen here with Lewis, George A. Ross, Deputy Minister, Ministry of Northern Development and Mines. The event was held at the Mirage Hotel’s Rumbar Lounge. 2012 Canadian-Corporate Mineral Exploration and Development Tax Credit. MPI thanks Martin R. Gagné, Partner, Quebec City at Fasken Martineau for permission to print. We also thank the firm for the invitation to attend the Global Mining Group Seminar held on February 24, 2012, at its Montreal office. It was a fascinating meeting that touched on: Mining In Quebec; Anti-Corruption Legislation, Consultation With First Nations,Takeover Defences, & so much more. 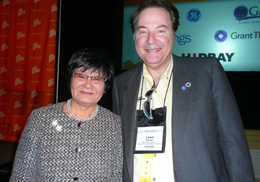 The Honourable Beverley J. Oda - Minister of International Cooperation. I felt strongly that Minister Oda should be applauded for her leadership in international development. She spoke of a more vigorous and thoughtful means of proceeding in mining. It would include all stakeholders & serve to improve foreign aid both in terms of developing public policy and implementing policies -on the ground-. Her comments received much applause from all attendees at the Royal York Hotel that evening. Click here for her speech. Christian Fortin of the Department of Geological Information- Mines Sector, Quebec Minister of Natural Resources & Wildlife. The several presentations of "Plan Nord" by Quebec officials were very informative. 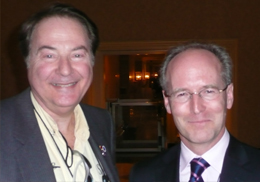 Unfortunately- the Minister of Natural Resources, Clément Gignac was unable to attend PDAC 2012 for a scheduled interview with Lewis. 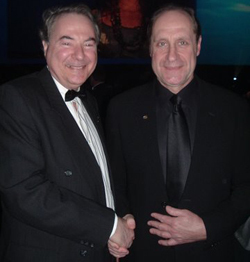 Our congratulations to Maestro Communications of Montreal, winners of two prestigious 2011 Summit Creative Awards for its General Electric-Canada submissions. Montreal firm gleans two awards for its creative campaigns. Montreal, 2011 - Maestro Communications, a Montreal West Island-based agency, won two awards at the prestigious 2011 Summit Creative Awards for its GE ads. Maestro's work was chosen amongst thousands of submissions from 22 countries. The Dedicated to the Core and DR2 Repeater ads produced for GE Mining Solutions and GE Lighting Solutions divisions respectively each received bronze level honours in the Trade Publication category. The creative team included Éric Léouzon, Creative Director and President, Luc Metivier - Art Director, and Gerry Wnek - copywriter. Summit International Awards (SIA), headquartered in Portland, Oregon, is an organization dedicated to furthering excellence in the marketing communications industry for nearly 20 years. The "Summit Creative Award" competition has established itself as one of the premier arbiters of creative and communication excellence for small and medium size advertising agencies. This honor is paticularly timely for Maestro Communications which celebrates its 10th anniversary this year. "We feel privileged to be recognized by the SIA, said Eric Léouzon. "These awards for excellence in a highly competitive market show that our efforts in recent years to think outside the box were not in vain" said Léouzon. Maestro Communications brings together a select multi-disciplinary group of talented communication professionals who together possess a considerable breadth of expertise in advertising, promotion, public relations and direct marketing. Their creativity, flexibility and capacity to balance proven experience with creative daring is what sets them apart from the competition. From a very bright & socially minded mining engineering student we are helping. He also has a poetic flair; see the MPI "Contact Us" page for an example of his expressive talent. I've written this recommendation of your work to share with other LinkedIn users. Details of the Recommendation: "This recommendation is my Thanksgiving sir. You are someone beyond my words that are insufficient to describe your traits and this is what I've figured out in the short duration of our contact through this professional community. I learned a lot and am still learning from your important emails and your website miningpublications.com, I will always remain thankful for all your favours. I wish you best of luck in all the challenges of your life. 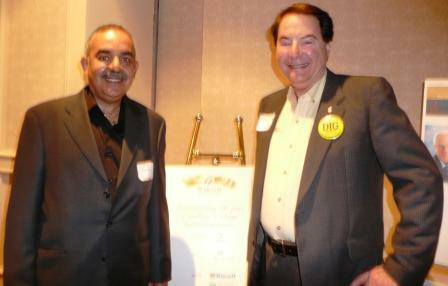 Many thanks to Norma Procyshyn & Professor Hani Mitri for inviting MPI to McGill's celebration of 140 years of mining engineering, on May 21, 2011. Over 250 guests were treated to cool jazz, sumptuous food & lots of unprecedented c-o-l-d Canadian brew. Since he joined Mining Engineering in 1986, Dr. Mitri has established the Mine Design & Numerical Modeling Laboratory and more recently the Rock Bolting Laboratory. His research and consulting activities focus on rock mechanics, geotechnical engineering, mine design and materials handling. Our invitation to "Mining Day On The Hill" hosted by The Economic Club Of Canada on Nov.24, 2009. 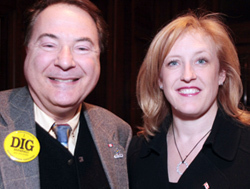 Guests of the Mining Association Of Canada (MAC), the event held in Ottawa, began with opening remarks by the Honourable Lisa Raitt, Minister of Natural Resources. Our invitation to "Mining Day On The Hill" hosted by The Economic Club Of Canada on Nov.24, 2009. Guests of the Mining Association Of Canada (MAC), the event held in Ottawa, began with opening remarks by the Honourable Lisa Raitt, Minister of Natural Resources. During our conversation, I found her to be well versed & an enjoyable speaker. Her Dad worked in our industry & I felt a certain "appreciation" she has perhaps garnered from him. Her remarks were very positive about our industry & focussed on the significance of a strong mining sector as we recover from the world-wide recession. I was impressed- this is a smart lady who truly knows her stuff ! I was especially looking forward to Don Lindsay's talk. He reflected on the opportunities & challenges facing Canadian mining companies like Teck Resources. I am always fascinated how very talented people shape their businesses not only with profit in mind. His review of Teck's charitable work in the field, in developing countries makes me very proud to be a Canadian & working in this industry. 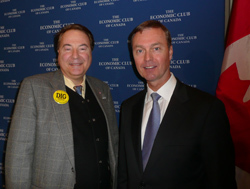 He delivered his views on the future of the exploration, mining & resource industries. Most important, I especially enjoyed how he expertly moulded their connection to Canada's long term economic success. Thank-you, Don, & I took notes in my Ontario Exploration Field Notes booklet ... Some other notable invitees were Paul Hebert, Executive Director of The Federated School of Mines plus Alana Kennedy, Manager, Marketing & Communications. She is with Mining Industry Human Resources Council. 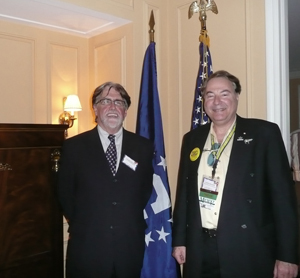 On June 4th, 2009 our organization was invited by Consul General Lee McClenny & Pierre Richer, Sr. Commercial Specialist, U.S. Commercial Service – United States Consulate - Montreal to address the West Virginia Trade Mission To Canada. The event was surgically promoted by our office and successfully attracted visiting Canadian companies to meet US members of this Mission, who are seeking partnership arrangements & sales assistance in Canada. 1) A general review of the situation in our industry but also the Good News happening in our country. Comments from our client suppliers were addressed. Developments especially in Quebec & the opportunities welcoming our US visitors to look at both Ontario & Quebec. 2) Results of a survey just completed & why it is vital for North American companies to understand the ramifications of: "short term pain for long term gain". He touched on why our West Virginian visitors must look beyond the downturn & make strategic acquisitions NOW.. He named names & touched on the other international players playing "Hard Ball" & for keeps in Canada. 3) He touched on the contentious issue of President Obama's "Buy America" policy & how it is impacting our industry. 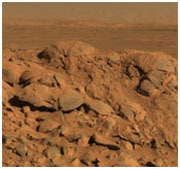 4) Finally - he reviewed mining on the Moon & on Mars & his association with the Planetary & Terrestrial Sciences Symposium. He also showed a sample of a substance that will turn coal into diesel fuel that few are aware of. Please email Lewis for details of this discovery. 2009 Update: The Ontario Government, Ministry of Northern Development and Trade announces the continuance in its fourth year, with Mining Publications International, of promoting Ontario's mining supply companies. 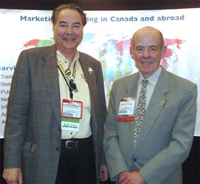 In 2009, the advertising exposure will be seen in the 15,000 monthly mailings plus 3,500 monthly distributions at 32 international trade shows and conferences. The promotional activities will again include advertising in the USA based " Mining Engineering" of the Society for Mining, Metallurgy & Exploration (SME). On behalf of our clients & the entire Supply community of Ontario, we extend our genuine thanks to The Honourable Michael Gravelle, Minister, Ministry of Northern Development and Mines for his concerted interest expressed to us and his very positive hands on support of our efforts to promote the mining communities of Ontario. Recently at the 2009 MinExpo in Las Vegas - he met with MPI's - Lewis Bonder to express his continued support of our best efforts for Ontario. Furthur developments and updates will be announced shortly. Photo - PDAC 2008 - Taken after extensive conversations with The Honourable Michael Gravelle, Ontario Minister, Ministry of Northern Development and Mines. Topics included the role that Mining Publications International has undertaken to assist the Supply community in Ontario.The Minister expressed a great deal of interest in our innovative promotional programs that include Canada Issues in the SME's "Mining Engineering" monthly publication and assisting almost one hundred Canadian exhibitors in 2007 and 2008 to SME shows. Our colleages who set up the first time ever- Canada Pavilions - attracted so many mine operators & plant superintendents that the Minister remarked, that I should keep in touch with his office to update him on our other 2008 innovations. He was happy with the many Ontario suppliers who we had helped & he pledged his assistance to our efforts to promote Ontario as the Canadian province of mining innovations. Click to hear Extraordinary sound clip-video captured from a deep subsurface geyser, Lupin Mine, Nunavut Territory, Canada. Spectacular demonstrations of capability that have terrestrial & space mining applications. Plus an eclectic blend of technical presentations that included: Biometric Drill design for in situ Astrobiological Studies; Proof of concept for a small lunar excavation robot; In the Mars yard & surrounding area; In situ geological analyzer for Lunar & Martian surfaces. In my opinion, the most fascinating one was by D. Linne and Gerald Sanders of NASA entitled: "Design considerations for an oxygen production plant in support of a Lunar base." The tour of the Canadian Space Agency was also spectacular and I want to express my thanks for the invitation, to Norcat and to Dale Boucher - Conference Chair. First pictured here on the Mining Publications Int'l. site, it's a prototype drill. It will form part of a still yet-to-be-developed robot that would bore 33 feet below the Mars surface, grab core samples, bring them back to the surface, and then identify each of the samples. The robotic system would process the samples for examination, slicing them into thin pieces or polishing & grinding them before handing them off for analysis. The "Canadadrill" weighs about 100 pounds and would use a rotating core drill bit with fused diamonds. The drill, with the accompanying robotic technology known as a subsurface sample acquisition and handling system, would sit on a fixed platform on the planet's surface. Congratulations to Mine Manager, Roger J. Emdin, P.Eng. of XSTRATA's Craig Mine, Sudbury Operations, Onaping Ontario. He has won our very limited edition: "Mining Map Of South America" at the 2007 CIM exposition in Montreal. It is currently valued at $ 80.00 US. Thank-you to all of the CIM seminar attendees for visiting our innovative clients who were exhibitors. Please visit our page: "Mining Trade Show & Conference Services" for news on our next conference: RETC (Rapid Tunneling & Excavation Conference) in Toronto, June 10 - 13. Contact MPI to be involved in our low cost & effective promotional programs. Effective April 20, MPI is especially pleased to welcome Jon Baird, Managing Director of CAMESE as an advertising agency for its members. MPI has put together exceptional discounts, free ads & many other incentives for all of its clients, now including CAMESE & its 250 members. Effective April 20, MPI is especially pleased to welcome Jon Baird, Managing Director of CAMESE as an advertising agency for its members. Existing relationships its members have with other agencies will be respected. Innovative monthly advertising programs can be viewed on the MPI site for all of our national & international publications. MPI has put together exceptional discounts, free ads & many other incentives for all of its clients, now including CAMESE & its 250 members. Now ... Here's the story behind the story ... Jon & I had a conversation at the annual CIM "Round Up' in Vancouver a few months ago. We know each other professionally & so when he approached me, I invited him to "my office" outside of the convention center, overlooking the Pacific Ocean. He laid out his idea to me & asked what I thought about it. To me ... it was an instant "slam-dunk". But getting authorizations from my publications ... that required insight & planning. Nevertheless- I successfully achieved what Jon & I had initially agreed to. 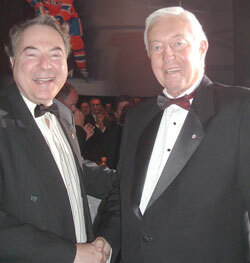 Recently, at the Jean Beliveau charitable event in Montreal, I spoke to the Canadian Prime Minister. How could I resist when he asked me ... "what kind of work are you into, Lewis". That's when I brought Jon's plan into my conversation & asked what he thought of it. The PM knows of CAMESE's work, as International Trade Canada does provide important financial contributions to it. He said I was working with an honourable guy & to get it together with him. He wished me well. 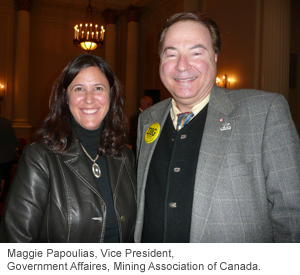 On November 21, 2006 MPI was invited by the Mining Association of Canada (MAC), to a reception at the Fairmont Chateau Laurier Hotel and lunch at Rideau Hall in Ottawa. More than fifty (50) Federal decision-makers were in attendance. The Honourable Gary Lunn, Minister of Natural Resources was the keynote speaker. The focus was on issues relating to the need for regulatory efficiency and project review plus the importance of geoscience in addressing declining mineral reserves. I broke bread with Sonia Couto, Trade Commissioner, Metals and Minerals, Business Sector Bureau. Valuable insights to the operations of the Trade Commissioner Service were very much appreciated. I hope to have some exciting news in the future from our tete à tete. A big “Thank-You” to Gordon R. Peeling, President & CEO of MAC for the invitation. They promote, through the collective action of their members, the growth and development of Canada's mining and mineral-processing industry, for the benefit of all Canadians. Also in attendance was my former president of the Canadian Institute of Mining and first ever female to hold that post: Patricia J. Dillon. Pat currently is the Manager of Corporate Relations at Tek Cominco. It was enjoyable talking to her, as she was surrounded by many of the attendees. She commented on my successes at CIM and that was very much appreciated. She looked great! Tim Kennedy, Director of Natural Resources & Environment, for Global Public Affaires shared our table and was an interesting person to talk to. Glenn Nolan, former President of PDAC. Currently Vice President, Aboriginal Affairs- Noront Resources Ltd.
Ingrid Hann, VP HR at de Beers Canada Inc.
Consul General Lee McClenny welcomes Lewis & his staff to his residence in the evening, following their presentation at The West Virginia Mission to Canada. 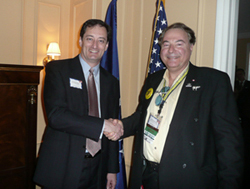 At 2008 MinExpo, Atlas Copco's Torbjorn Redaelli, President & General Manager with Lewis. 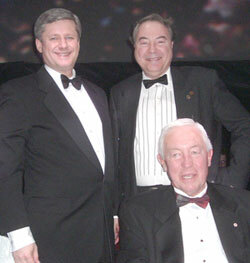 Pictured above, Lewis with Canadian Prime Minister Stephen Harper and seated, NHL legend Jean Beliveau. The celebration was held on March 29, 2007 in Jean's honour with charitable proceeds to benefit children's hospitals in Quebec. Many thanks to Madeleine Supino, NHL Director of Central Registry-Systems, for a fabulous evening. Jean Beliveau has represented for me those personal aspects that I have tried to make part of my business career. They include: dedication, perseverance & respect to both clients and competitors. He will always remain a class act who has set the tone; the vibration that comes as close to perfection as I can imagine. Bravo Jean, for your charitable work & resolve to make it happen! Bob Gainey served as general manager of the Montreal Canadians hockey team from 2003 to 2010. Another true gentleman & hockey super star, like Jean Beliveau . He has an exceptionally engaging personality & he shared some of his incredible historical hockey career with me. He played with passion with the team from 1973 until 1989. He spent his entire career playing for the Canadians in the NHL. He was team captain of the Canadians from 1981 until his retirement in 1989." 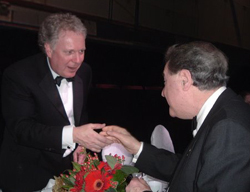 Jean Charest is the current premier of the province of Quebec. He is leader of the Liberal Party. We engaged in a spirited discussion on investment in mining exploration in Quebec. Only about 40% of Quebec's mineral potential is now known. I asked numerous questions on management of mining royalties and mineral titles; why we still support the asbestos industry & why Quebec still does not promote bilingual education in a very changing population mix in the province, that is leaving French speaking children with an extremely poor grasp of the English language. He couldn't answer all my questions but we shared a friendly yet spirited exchange at the head table. "